Back in July, a survey found that one-third of iPhone users mistakenly thought their phone offered 4G data. But Android users who think that aren’t far off the mark. 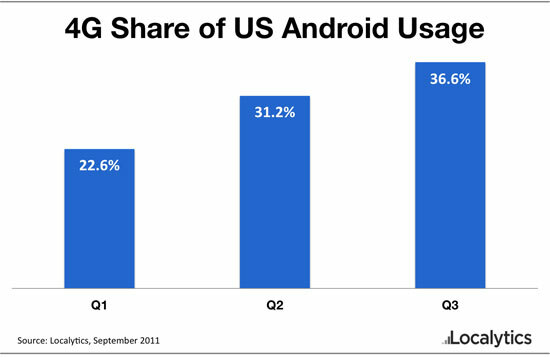 A new study by analytics firm Localytics found that 36.6 percent of U.S. Android devices in the third quarter offer 4G. Localytics said the percentage of usage of Android devices that offer some flavor of 4G (WiMAX, HSPA+ or LTE) has grown markedly up from 22.6 percent in the first quarter to 36.6 percent in the third quarter, more than a 50 percent increase. The growth is driven by a slew of Android devices on various carriers that are increasingly sporting 4G speeds, devices like the HTC Thunderbolt, HTC Evo 4G, HTC myTouch 4G and the Atrix. Apple is expected to unveil its next iPhone in the coming weeks though most predictions don’t include LTE 4G. If that comes to pass, that will be one of the big differentiating points between the iPhone (s aapl) and many Android (s goog) devices. For those consumers who crave super fast speeds, Android may look more appealing. That might be explain why Android has been on sales tear lately. And application developers might be further enticed to look at Android because of the potential for higher data speeds for their apps. But the same Retrevo report found iPhone users are mistaken about their phone’s 4G capabilities also found that 61 percent of iPhone owners say they don’t care if the new iPhone has 4G or not and will buy, or “consider” buying, the next iPhone regardless of 4G. So for many users, speed may not end up being a factor. Many may prefer the battery sipping performance of 3G on the next iPhone, which is generally better than on Android. With so much interest in the next iPhone, the lack of 4G probably won’t hurt it much initially. 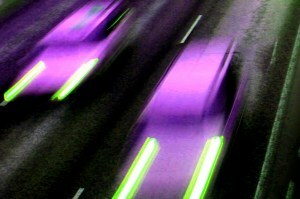 But it won’t be long before most Android phones are riding on 4G. Apple may be able to put off 4G for one cycle but next year, with so many Android devices expected to be running on 4G, it’s likely that it will have to join the 4G bandwagon. That’s going to be a huge deal not having the new iPhone on 4G, especially for verizon customers, most of which have 4G available where they live. I think Apple can get by without 4G for a cycle and should be able to scoop up existing iPhone users. But it may have a harder time luring over Android users who are on 4G and increasingly expect it now.